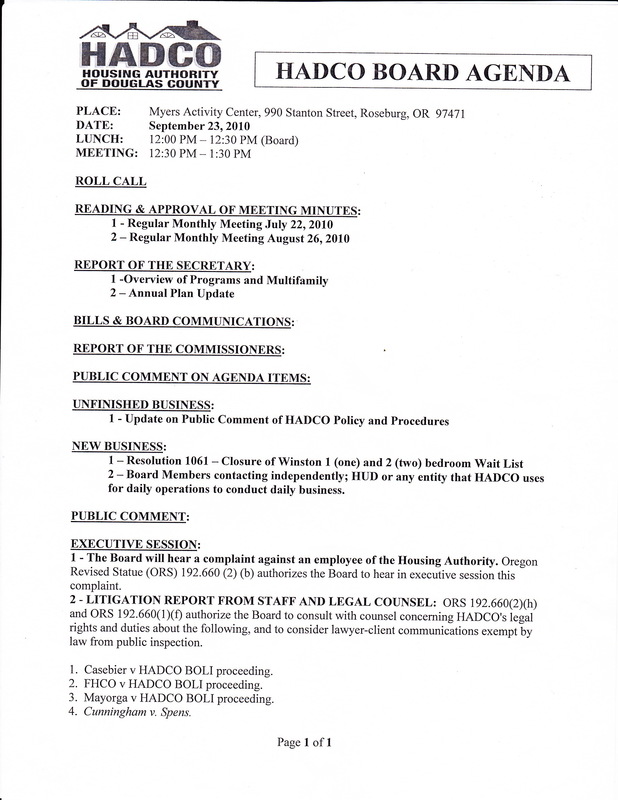 HADCO Board Agenda for September: How many claims can we pay for? The #1 Item is a complaint I filed with the HADCO Board in March of this year about the Executive Director Dolly Newman and her behavior toward me. I filed this letter of complaint with them before they were to evaluate her and decide whether she had earned a raise. Although my complaint has not been dealt with until now (and I have little hope of it being dealt with appropriately now), the HADCO Board has given her a 10% raise. I took this route in hopes of avoiding having to take the drastic steps I did regarding HADCO Commission member Chris Spens. Which leads to the agenda item Cunningham vs. Spens. In June of this year I filed a lawsuit in federal court naming Chris Spens a defendant for his actions toward me that exceeds his authority as an appointed public official. This stems from a history of inappropriate behavior of Mr. Spens toward me. In another post, I will provide a copy of my suit, as well as Spens’ response. I made an offer through his (and HADCO’s) attorney that was rejected. I can only assume the client in this case is HADCO Commissioner Spens and not the entire HADCO Commission because I offered to drop not only any monetary claim I might have against Spens personally but any claim for liability that I might have against HADCO on two conditions: Chris Spens resign from the HADCO Commission and write me a letter of apology. Pretty simple way to eliminate the financial liabilityof this taxpayer funded public agency. So would it not be in HADCO’s best interest if Spens resigns? So does this not create a direct and actual conflict of interest between HADCO Commissioner Spens and HADCO as a whole? Seems it does. Now there might be another conflict of interest from CEA member and HADCO Commissioner Jamie Sanchez because, as many people know, she is my daughter. As a public official in Oregon, Commissioner Sanchez should remove herself from and discussion or decision on anything in my case against Spens that I might benefit or suffer a detriment from. Commissioner Sanchez has already contacted the Oregon Ethics Commission to confirm what she must do under the law to make sure that she is not doing anything wrong regarding this case. However, you don’t need to be my daughter to see that my offer to Spens is fair, if you really know what has been going on with this guy and his failure as a HADCO Commissioner. That brings me to the second category of Executive Session items. Besides my lawsuit against Chris Spens, there are four other cases against HADCO. Although they have not reached the court stage, each of these items is before an adminstrative agency reviewing HADCO housing discrimination practices. Each also has the potential to become a federal or state court case and have already costs HADCO pretty spendy lawyer time. Can anyone guess the common denominators here? Although Ms. Newman is not directly involved with the issues of the lawsuit against Chris Spens, she is a player. However, she played a prominent role in each of the housing discrimination claims and Spens has been the only person on the current HADCO Board who has overseen it all.